This feast was observed on this date in the fourth century. It celebrates the holy birth of “the greatest of all the prophets, ” the one who leapt for joy in his mother’s womb, who prepared the way for Christ, announced his presence, and baptised him in the Jordan River. As the feast of Christmas christianised the celebration of the winter solstice with the theme of the “unconquered sun”, so it would seem does the feast of the Birth of John the Baptist – six months earlier – christianise the summer solstice celebration from traditional religions. Celtic folklore associated the themes of fire and water with this feast. Patrick Duffy explains. Three factors seem to have influenced the emergence of this feast in the early fifth century. The first is probably the emergence in the early fourth century of the feast of Christmas. The second is the verse of Luke gospel where the angel tells Mary at the annunciation that her “kinswoman Elizabeth already in her old age and considered barren is now in her sixth month, for nothing is impossible with God” (Lk 1:37). The third is that three authorities from the 5th and 6th centuries – St Augustine (354-430), the Martyrology of Jerome and the Calendar of Carthage – all emphasise that this feast celebrates John’s earthly birthday, and not (as was customary with martyrs) the day of their death, or their birthday into heaven (dies natalis). It is one of very few feasts left in the Roman Calendar that have a vigil liturgy. There are many indications in Irish folklore that this feast, Féile Naomh Eoin, was until recently the occasion for a wide range of ritual practices and merrymaking beginning on the previous evening – St John’s Eve. 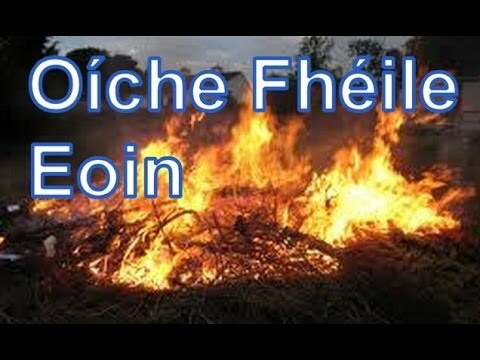 This was Oíche an Tine Chnáimh, “bonfire night”, or Tine Féile Eoin, “St John’s fire”. A similar feast with similar summer solstice themes called the Ivan Kupala Day is celebrated in Poland, Russia, Lithuania, Belarus and Ukraine. People would throw more weeds into the fire to ensure they would not grow in the fields, and ashes from the fire would be scattered on crops the following day to ensure fertility. Women prayed for good weather and God’s blessing on the crops of the fields. Neglect in this respect might lead to a bad harvest or poor fishing. Later there would be music and dancing. When the musicians struck up, young men asked their partners to dance. In-between sets, songs were sung, stories told, and soloists – musician or dancer – demonstrated their talents. When the fire would be well ablaze, people would leap through the flames for luck in a new venture, for marriage, when trying for a baby, for good health and for self-purification. In many places, a young woman and man would join hands and jump together. Often, this was nothing more than a mere flirtation, but onlookers surmised at intentions of marriage between the couple. Some would hazard a prediction on the outcome of such a union by the way the flames flickered as they jumped! 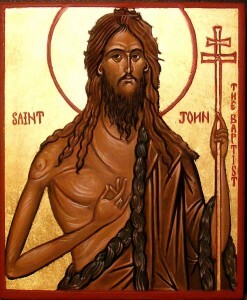 People rationalised the fire ritual by claiming St John the Baptist was burnt alive, but in fact the Gospels tell us that King Herod had him beheaded. Another custom at this time was to gather the herb known as St John’s wort (Hypericum perforatum) used for a wide range of medicinal purposes and popular today for the relief of depresion and stress-related illnesses. There were also many holy wells dedicated to St John around the country at which pilgrimages and “patterns” would be held on his feast day and which were believed to bring cures. Swimming in rivers and the sea began around this time. The Gospel reading of the Vigil Mass records the angel’s appearance to Zechariah to foretell John’s extraordinary birth, Zechariah’s unbelief and being struck dumb (Lk 1:5-17). The Gospel of the Feast tells of the delight of Elizabeth’s giving birth, the child’s circumcision and Zechariah’s amazing recovery of speech when he confirmed by writing on tablets: “his name is John” (Lk 1:57-66. 80).